Sharps Barber and shop was born in the USA with the view that simple grooming sounded ‘stuffy’. With this idea in mind, the Sharps team set about creating an environment that was relaxed and multifunctional; an area where you could go and get a trim whilst relaxing with a beverage. Sharps built itself around two central ideas; providing a service and environment that ensured the modern man was comfortable in his own skin. Sharps also produce a range of no-fuss men’s prepping products that do the job in an instant. The brand launched their first product, Kid Glove Shave Gel, in 2003, at a small Barbershop in New York. Today, the Sharps team provide a wide range of products helping the modern man to maintain himself. The style of sharps barber is quintessentially American. 1950’s in style, the barber chairs complement pictures of iconic, well turned out men on the walls, acknowledging the style of the good old past. The service provided, however, is nothing short of forward thinking. Coffee bars, TV’s anchored to the walls, ping-pong tables and a New York cafe at the front of the shop make the Sharps brand bachelor heaven. Sharps Barber and Shop began its journey in London in 2002, in Charlotte Street. 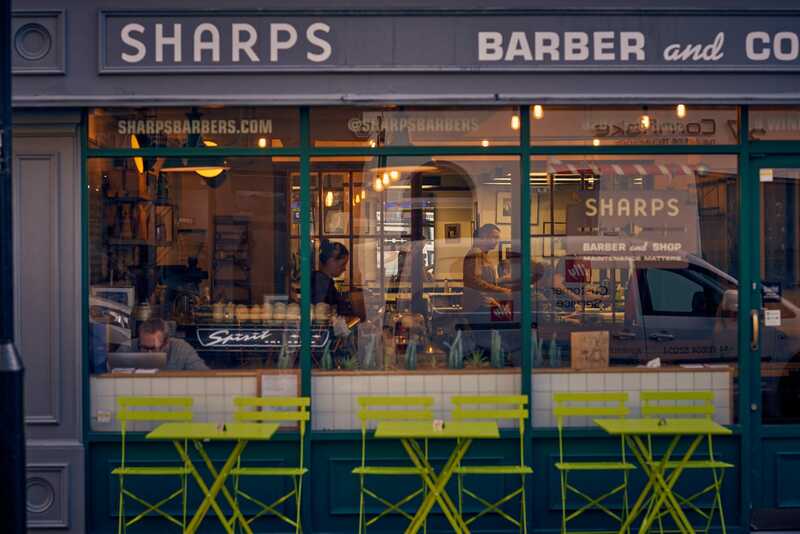 Sharps London continued to reflect the brand’s original desire to combine the best in grooming with a cool environment in which to relax after a hard day’s work. In 2013, the flagship store relocated, down the road, to 9 Windmill Street in Fitzrovia; an area that is defined by its professional community. Fitzrovia is the perfect spot for a modern establishment like this one. The professional, working man requires a place where he can go on a Friday evening to put his feet up, sip a beer and be prepped for the night ahead.